The aim of this study was to describe propacetamol pharmacokinetics in term and preterm neonates to suggest dosing regimens. 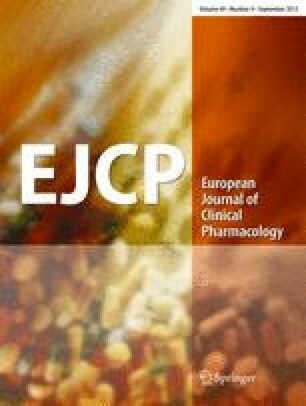 A population pharmacokinetic analysis of paracetamol (acetaminophen) time–concentration profiles in 48 neonates was undertaken using non-linear mixed-effects models. Neonates were given either single (n=30) or multiple doses (n=18) of propacetamol infusion over 15 min. Neonates had a median postnatal age of 1 day (range, 1–76 days). Median post-conceptual age (PCA) was 35 weeks (range, 27–42 weeks), and median weight was 2.4 kg (range, 0.51–4 kg). The population volume of distribution estimate and between-subject variability (%) for a one-compartment model with zero-order input and first-order elimination was 70.4 l (30.7%)/70 kg. Clearance increased from 2.85 l/70 kg, CV 40.7% at 27 weeks PCA to reach 7.05 l/h per 70 kg by 42 weeks PCA (standardised to a 70-kg person using allometric “1/4-power” models). Between-occasion variability for volume of distribution and clearance were 17.4% and 26%, respectively. A mean paracetamol steady-state target concentration above 10 mg/l at trough can be achieved using a loading dose of 40 mg/kg and maintenance doses of 20 mg/kg 6 h in 28-week PCA neonates, 25 mg/kg 6 h at 32 weeks, 30 mg/kg 6 h at 36 weeks and 20 mg/kg 4 h at term (propacetamol doses). Since the role of the oxidative enzyme CYP2E1 and production of the hepatotoxic metabolite N-acetyl-p-benzoquinone-imine still is unknown in premature neonates, lower doses scaled by age-related clearance and centred on a daily dose of 60 mg/kg per day in a child of 6–8 years with a clearance of 0.25 l/h per kg (12.5 l/h per 70 kg) may be more appropriate. Research of Gunnar Naulaers is supported by the Fund for Scientific Research—Flanders (Belgium), Clinical Doctoral Grant A6/5—CM. D 11.354. Warning: all doses in this paper are reported as prodrug; 1 g of propacetamol equals 0.5 g of paracetamol. We greatly acknowledge the assistance of Marien A.L. Pluim, PharmD, Department of Pharmacy, Erasmus Medical Centre, Rotterdam, The Netherlands and of S. Demarsin, laboratory technician, Center for Clinical Pharmacology, Leuven, Belgium for analysing the plasma samples.